We will draw world attention to Biafraland on May 30 – IPOB – Royal Times of Nigeria. 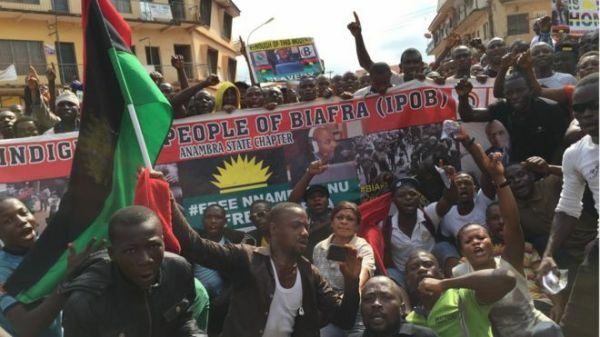 The Indigenous People of Biafra (IPOB) has said it would not back down from its sit-at-home protest in the South-East and South-South regions on May 30. In a statement released by its Media and Publicity Secretary, Emma Powerful, IPOB said all markets in the Biafra territories must be closed on the day, stating that the protest would also be used to honour the memory of pro-Biafra activists who lost their lives in clashes with security agencies. The statement reads; “We advise Biafrans home and abroad, no matter your place of residence in Biafra and Nigeria alike, to make sure you terminate your journey before 12 midnight on May 29, 2017 as there would be no vehicular movement anywhere in Biafra land one minute past 12am on the 30th. “We (will) draw the attention of the world to Biafra land on that day. The death of our soldiers and agitators can never be in vain,”. “The countdown to the May 30, 2017 Remembrance Day has begun. We, the Indigenous People of Biafra, under the leadership of Mazi Nnamdi Kanu, wish to reiterate once again that our May 30 remembrance of our fallen heroes and heroines remains a priority for every Biafran both home and abroad, no matter the efforts by the Nigerian government-paid saboteurs and threats from security operatives designed to discourage the general public from sitting at home as ordered by our leader.